Ricky Zamora and his mother travel from their home in Blue River, on the western side of the Cascade Mountains in Oregon, to his Uncle John’s ranch on the eastern side of the Cascades. Ricky uses his trip as an opportunity to draw maps of what he sees as the terrain changes from the western side of the range to the eastern side. As they approach the ranch, they witness a severe thunderstorm and lightning ignites a wildfire. Ricky leverages the experience to learn more about wildfires and document his knowledge on a variety of maps. The author uses a narrative, hand-drawn maps, illustrations, and diagrams to provide rich content. 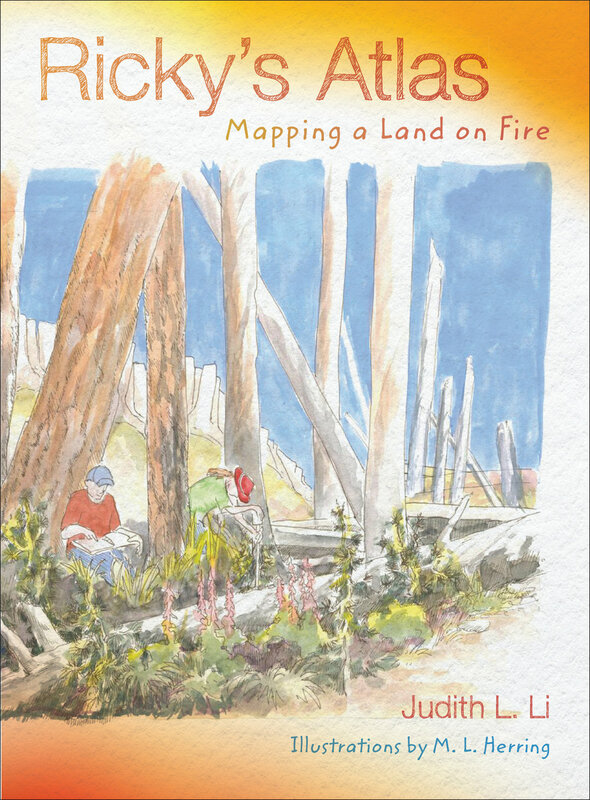 In an easy-to-read style, the author contrasts the climate and vegetation on the windward and leeward sides of the Cascade Mountains, and details how firefighters contain wildfires and how wildfires can help the growth of vegetation and specific types of trees. The maps show changes in vegetation, elevation, amount of rainfall, and include scales to show distance. The section of prehistoric fossils helps the reader understand that at one time, a prehistoric sea and sea creatures covered the region. This helps students understand the climatic differences of moist air traveling over a mountain range and creating lush vegetation on one side and a drier climate on the leeward side. Judith L. Li, a retired associate professor in the Department of Fisheries and Wildlife at Oregon State University, is a stream ecologist. She spent many summers studying stream bugs and fish on the "east side" where Ricky's Atlas takes place and enjoys working with K–12 science teachers. She is the author of Ellie's Log: Exploring the Forest Where the Great Tree Fell, the editor of a volume on cultural ecology entitled To Harvest, To Hunt: Stories of Resource Use in the American West, and coeditor of Wading for Bugs: Exploring Streams with the Experts.